Nestled in a magnificent residence in the Malibu Hills, with a sweeping panorama of the Pacific Ocean is The Shore- the ultimate recording retreat. Malibu has been the recording destination of choice for many of the biggest bands and has inspired countless legendary albums. 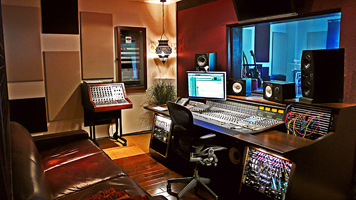 The Shore introduces resort recording, a recording environment that combines style with substance. This unique, fully serviced studio is built for privacy and designed to pamper. The surrounding nature, sumptuous furnishings, latest technology and full suite of professional and personal service providers are tailored to maximize the artist's experience. Accommodations include, an expansive master suite, two additional double bedrooms, five full bathrooms, chef's gourmet kitchen, studio office, dining room, Jacuzzi and grounds- a luxury spa setting with state of the art recording. In house equipment offers a perfect balance of vintage and new. Featuring, SSL900+, Neve RM-8 console complete with 1084's. Additionally, Neve 8801's API 512's, 5508's UA610's and 1176's. The custom patch bay enables seamless integration of third party outboard gear. The Shore's studio offers a vintage Neve RM-8 console with 1084 mic-pre's/EQ's, Digidesign Control 24 Control interface, Pro Tools HD v.7 powered by a Macintosh G5 Quad Processor, including various outboard gear such as Neve 8801 Channel mic-pre/EQ's, API 512's & 5508's, Universal Audio 610's and 1176's. A microphone list is provided upon request.All rooms are acoustically optimized and the isolation booth is equipped with AV- ideal for ADR. Full integration in Tracking Area 2 allows for an optional 1500sq ft of recording space. Additionally, The Shore is a fully operational production facility specializing in product development and artist management. Our staff roster includes producers, engineers, programmers and marketers.